-Sachs 48 mm closed cartridge fork with anodized slider: stiffer and more resistant to wear, while providing less friction. SKF low-friction fork seals and wipers are also installed. -New fork shoes (yoke): stiffer and lighter. -New fork guards: designed together with the shoe to combine practicality and design while providing more strength. -Fully redesigned ZF Sachs shock: with more compact 46 mm piston, about ½ lb. lighter. The new piston has been designed to ensure more stable operation as the oil temperature varies, while increasing sensitivity to enhance comfort and traction. The small upper base and reservoir have also been redesigned to be farther away from the exhaust pipe while minimizing weight. The new spring is also lighter. For racing, the 2-stroke range has no automatic oil injector and requires pre-mix. This feature was removed to reduce weight. -Quick-release front axle pull: speeds up tire repairs, saving precious seconds in race situations. -Moto-Style hand guards: modern design, tough and "In-Mold" graphics; ideal for extreme off-road riding. -Black Aluminum footrests: light yet strong, wider than the standard model's steel pegs to ensure maximum, long-lasting grip under all conditions. -Racing seat with document pocket. -Racing graphics and red rim stickers. 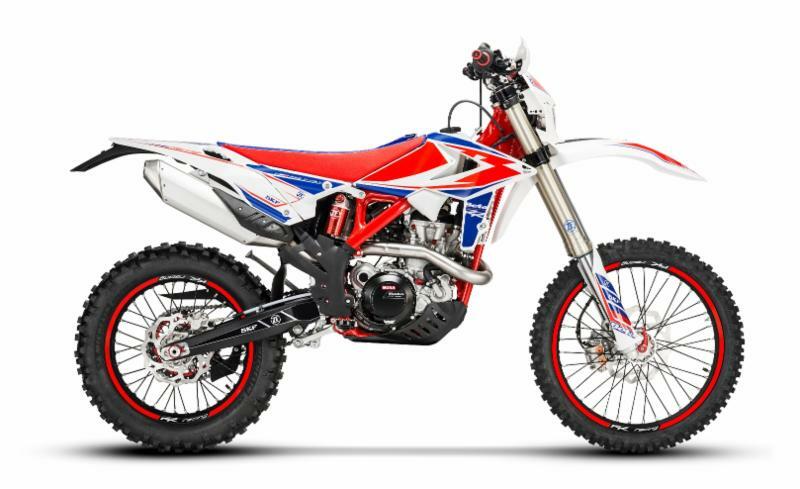 The 125 RR Racing Edition 2-stroke is a stunning achievement: in addition to all the above, it boasts a suspension system specially designed for the 125 chassis. -Same front and rear suspension as the larger Racing models. -New cylinder, with modified exhaust port and timing charts. -New exhaust valve system and new boosters. -New clutch cover with air bleed system to give the clutch improved feel, a modified oil filler cap position.